…. Sooo, once inside we began to absorb the fantastic interior of this building and as for me… I didn’t make a single PEEP! (Unlike the schoolchildren on a field-trip who were screaming their heads off and tramping helter-skelter up and down the marble-tiled foyer!!) 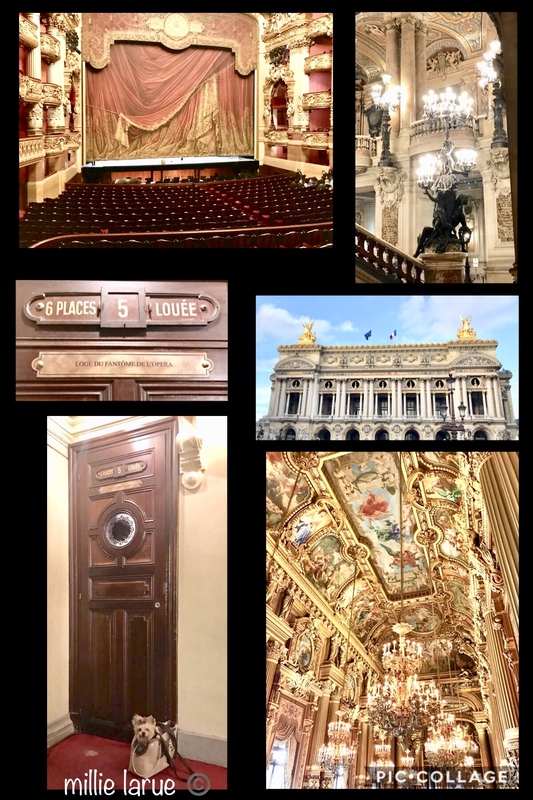 Let me tell you that if you are visiting Paris and don’t have time to go see Versailles… just go and see the Garnier Opéra House!!! There is enough gold and marble here to fill your senses and make you shake your head with wonder. Here is a little history on the Opéra House for you… there is lots more, but I will try to hit the basics. The Palais Garnier is the most famous opera house in the entire world. It was designed by Charles Garnier for Napolean III in 1862 and took 14 years to build. At 35 years old, Charles Garnier was an unknown architect and this was the first thing he had ever built. All along the Avenue de l’Opera which takes you straight to the front of the Palais Garnier, every single tree was removed along the avenue so that there would be an unobstructed view of this magnificent building. Underneath the building is a lake which helps to catch water run-off and in the present day, is used by firemen to train them in water rescues. This lake was also one of the inspirations for the book THE PHANTOM OF THE OPERA by Gaston Leroux. Box #5 is the MOST FAMOUS of all the boxes in the gilt and red velvet auditorium because that box belonged to “the phantom” and here in the picture you can see little me sitting in my bag just beside THE PHANTOM’S DOOR!!! The Opéra House was not just designed for the operas, but as a place where people of society went to be seen. The intermissions were as important as the opera!!! The fabulous Grand Foyer made of red, white and green marble, and topped with a domed ceiling covered in mosaics was where everyone gathered in their beautiful gowns and fine suits. Even the auditorium was designed with society in mind… Garnier draped everything in RED because he said that the color red reflected well on the faces on women, giving them a healthy, youthful glow. Despite all of the gold that you see everywhere, only 2.5 kilos of goldleaf was used in the entire opera house, which is still a lot, but in many places Garnier used a technique where a raised surface was tipped in goldleaf and the recesses were painted in a deeper golden paint… actually giving the object more depth and definition than had it been totally covered in gold!!! The entire cost of the building was around 7 million francs which would be about 313 million euros today. While the grand house was indeed built for Napolean III, he never actually saw the house completed and only ever saw the OUTSIDE of the Opéra. The Franco-Prussian War sent him into exile and he died in 1873, two years before the Garnier Opéra House was completed. Today, a new opera house has been built ( the Bastille Opera House) which holds mosts of the operas in Paris and the ballets are still held at the Garnier Opéra House. Tip: If you make it over here, as you are walking up the Grand Staircase, look for the large bronze salamander climbing the marble handrail just next to a large column. It is a good luck charm believed to protect the opera house against fire. So glad they came to their scences and allowed you and mommy inside. This is where we saw the ballet, Decadance, in the middle of October. A truly beautiful building. 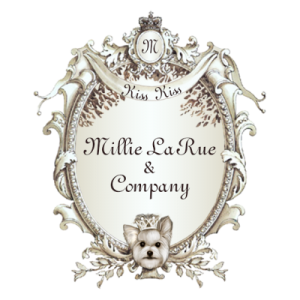 Oh Millie what an experience you have had in Paris. I love it there! If I get the chance to go again I swill ask for you to be my “tour”guide. How beautiful Millie. So glad you were able to see it. Thanks for sharing. Absolutely ridiculous that those people can’t get their stuff together. You either allow doggies or you don’t and it’s really not that difficult! Magnificent! What Splendor! I’d love to see The Opera House. I would have loved to see and hear Luciano Pavaritti . He’s my favorite! Heaven gained a truly awesome voice when he passed. I love the Three Tennors. My Mother loved Operas, she loved Beverly Sills. Millie you and Mummy are so blessed. Millie glad that security man came to his senses. 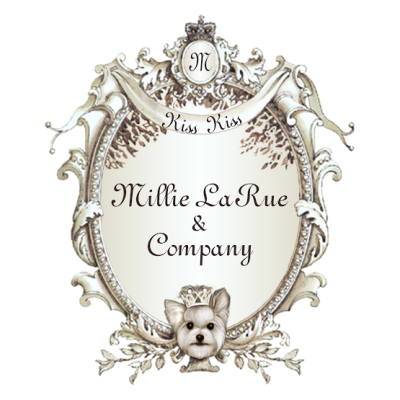 Oh Millie, I’m SO HAPPY that you and Mummy got to tour the Garnier Opera House together! Your Mummy is very brave and persistent. I just LOVED it! My friend Marci and I went there on my birthday in 2016 and I thought it was MORE impressive and beautiful than Versailles. It was one of my favorite sights in Paris.